Serving clients throughout the State of South Carolina -Family and Divorce Mediation -Negotiation of Separation and Divorce Settlements -Family Court Litigation -Family Court Appeals Family and divorce cases involve some of the most sensitive areas of life. Attorney Shawn Reeves strives to handle those cases in a professional and caring manner with the client's best interests and goals in focus. Shawn is a solo practice lawyer. He offers each client the personalized attention vital to effectively litigate and negotiate the resolution of family court cases. Shawn utilizes modern technology and a network of professional referral sources such as financial experts, investigators, and mental health experts to assist client in resolving their family cases. Shawn is also a Certified Family Court Mediator in the State of South Carolina and is available to conduct family mediation throughout the State. Attorney fees are billed pursuant to either a fee schedule or an hourly rate, depending on the type of case. Clients are responsible for costs such as court filing fees, process server fees, court reporter fees, and expert fees. Prior to beginning representation, this office requires each client to sign an attorney fee agreement detailing the fee structure for the particular case. This office also generally requires payment of a retainer fee prior to beginning representation. This office accepts payment by check, cash, MasterCard, and Visa. If you would like to meet with Shawn to seek representation by this law firm, the first step is to schedule an initial consultation. During that meeting, Shawn will take the time to listen to the details of your unique situation and will discuss your legal alternatives. To schedule a consultation, use the Contact form on this website. The Law Office of Shawn L. Reeves, LLC is available to provide legal services to clients in divorce and other family court cases not only in Richland County (Columbia) but also throughout the State of South Carolina including Lexington County, Beaufort County (Beaufort, Bluffton, Hilton Head), Dorchester County (St. George, Summerville), Charleston County (Charleston, Mt. Pleasant, North Charleston, James Island, John's Island, West Ashley), Berkeley County, Orangeburg County, Horry County (Myrtle Beach, Conway), Colleton County (Walterboro), Georgetown County, Greenville County, Greenwood County, Spartanburg County, Sumter County, and York County (Rock Hill, York). Divorce and Separation n South Carolina, a divorce may be granted on one of the following five grounds: (1) adultery, (2) desertion for a period of one year, (3) physical cruelty, (4) habitual drunkenness or drug use, and (5) separation without cohabitation for a period of at least one year. The divorce on grounds of separation without cohabitation for a year is South Carolina's "no fault" divorce, and it is the most common type of divorce in this State. The ground for divorce must be properly proved in the family court for the court to issue a Decree of Divorce. If no current ground for divorce exists but the spouses are separated and no longer living in the same house, the parties may initiate an action for Separate Support and Maintenance. An action for Separate Support and Maintenance is similar to a divorce action and can deal with the issues of the marriage including dividing marital property, custody and support for children, and spousal support or alimony. In certain very limited circumstances, the parties may obtain an annulment. In an annulment, the court declares that the parties' marriage is void, and no divorce is necessary. Divorce and separation cases also typically involve other issues such as equitable distribution of marital property, child custody, child support, visitation, alimony, and attorney's fees and costs. The family court has jurisdiction over all these issues in a divorce or separation action. The vast majority of divorce or separation cases settle without the necessity of a contested trial in the family court. In certain cases, parties reach a separation agreement at the time of separation before any formal litigation is filed with the family court. In other cases, the divorce or separation process begins with contested litigation and possibly several contested family court hearings. A formal mediation is required in many South Carolina counties to attempt settlement of a case. If a settlement is reached, the attorneys usually put the terms of the settlement into a written Separation Agreement or Settlement Agreement and seek to have that agreement approved by the Court. When divorce or separation cases cannot be settled prior to trial, each party must present evidence to the family court to seek to prove her or his case to the family court judge. Family court trials may take as little as a few hours or as long as several days. At the conclusion of a trial, the judge (not a jury) will decide the case based upon the evidence presented as applied to South Carolina law. Child Custody, Visitation, and Support The South Carolina family courts handle issues involving child custody, visitation, child support, and restraining orders regarding the care and well-being of children. Child custody, visitation, and child support are often at issue in divorce and separation cases. They can also be issues disputed between parties who were never married. Additionally, the family court may modify an already-existing custody, visitation, or support order where there has been a substantial change in circumstances and where the best interests of the child would be served through modification. No matter the type of case, the family courts consider the best interests of the child with paramount importance. Generally, the parent who does not have custody of the children will have visitation rights. Standard visitation orders typically provide for visitation rights on certain weekends, certain weeks during the summer, and certain holidays, depending on the circumstances of each case. Child support is generally dictated by the South Carolina Child Support Guidelines. Child support per those guidelines is generally a standard calculation taking into consideration each parent's income, medical insurance costs, health care costs, and daycare costs, among other factors. The South Carolina Department of Social Services has a child support calculator on its website for further reference. Often in cases involving children, the family court will appoint a guardian ad litem to represent the best interests of the children. This is usually another attorney who has no prior connection to either parent or litigant. The Guardian ad litem will usually conduct interviews, conduct home visits, and prepare a report to the court regarding her or his investigation. Alimony and Spousal Support South Carolina family courts can award spousal support or alimony in certain separation and divorce cases. The family court can require the payment of alimony either by direct payment from one spouse to the other, payment through the court, and/or wage withholding. Equitable Distribution of Marital Property In most separation and divorce cases, the parties are entitled to a division of the property of the marriage between themselves. Equitable distribution of marital property typically requires a four-step process. 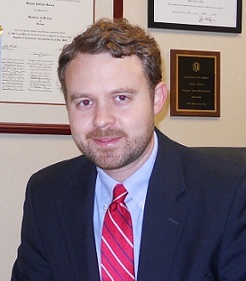 Shawn Reeves is a Columbia, South Carolina family lawyer and Certified Family Court Mediator. Shawn was born in Charleston, South Carolina and grew up in rural Dorchester County where his family has deep roots in the Dorchester, Rosinville, and Reevesville communities. Shawn graduated from the College of Charleston in 2001. He attended the University of South Carolina School of Law where he was a member of the Moot Court Bar, served as Associate Justice of Administration for the Moot Court Bar, and served as a member of the Pro Bono Board. He received his Juris Doctor degree from the University of South Carolina School of Law in 2004. Shawn was admitted to practice law in the State of South Carolina in 2004 and is a member of the South Carolina Bar. He is also admitted to practice before the Federal courts of the District of South Carolina. Shawn was previously an Assistant Attorney General for the State of South Carolina and an associate attorney with the law firm Harvey & Battey, PA in Beaufort, South Carolina. Shawn is married to the young adult novelist Amy Carol Reeves. He and his family live in the Melrose Heights neighborhood in the City of Columbia. Admitted: 2004, South Carolina; 2005, U.S. District Court, District of South Carolina. Law School: University of South Carolina (Columbia, SC), J.D. Member: South Carolina Bar; American Bar Association. Biography: Assistant Attorney General, South Carolina Attorney General Office, Columbia, SC, 2005-2007; Associate, Harvey & Battey, PA, Beaufort, SC, 2007-2010; Law Office of Shawn L. Reeves, LLC, Columbia, SC, 2010-present.